New York, NY (February 7th, 2017) – FITE, the programming network for viewing ring sports live, announced today that starting 8am EST Thursday February 9th, all Pay-Per-View programs on the FITE app will be available to watch free for 24 hours for existing and new FITE viewers globally. The promotion marks the celebration for FITE's one-year anniversary when the FITE mobile app was first launched to market. All users with the FITE app installed can select a Pay-Per-View from FITE 2016 calendar and watch it for free on that day. "It's been an incredible first year. FITE is made for fans by fans and we wanted to say thank you to all viewers for sharing our passion and joining us in our quest to build the destination place for fighting sports content and fans", commented Kosta Jordanov, Founder and CEO of FITE. The one-day free promotion will feature shows from popular MMA, Boxing and Pro Wrestling programs streamed on the app including World Series of Fighting, Golden Boy Boxing, Ring of Honor Wrestling, Impact Wrestling, LA Fight Club, Warrior Extreme Cagefighting, Hard Knocks MMA, WhatCulture Pro Wrestling and more. "We're privileged and grateful to be joined by world-class promotions who share our vision of the future of televised fighting sports where everyone can enjoy their favorite programming on their own schedule and on any connected screen around the world with the convenience of just a mobile app", commented Michael Weber, COO of FITE. The free programming is available on the FITE app only but using the instant stream-to-TV functionality of the app, viewers can tune in to the action on their phones and play it on any WiFi connected TV around the world with just a tap. The free-for-a-day promotion will unlock Pay-Per-Views across the app calendar and the on-demand section from 8am EST Feb 9 th till 8am EST Feb 10 th 2017. The application is free to download from iTunes and Google Play and asks for a quick free registration to start watching. There are no commitments and no credit card required upon signup. FITE TV ( www.fite.tv ) is a programming network that brings live and on-demand ring sports programs to MMA, wrestling and boxing fans around the world. 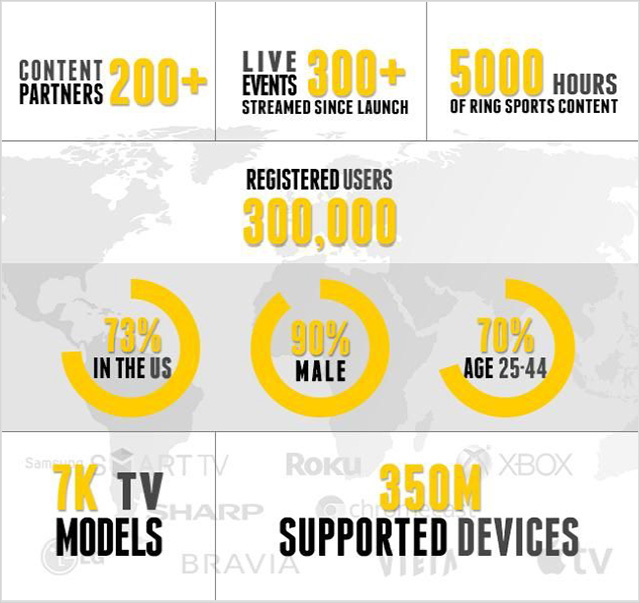 With only access to a smartphone and a connected TV, with the FITE app, viewers can watch live events, on-demand programming, interviews and fighting sports related movies and documentaries on the big TV screen. During the last few months, FITE has tripled the viewing time by user and has become a shared space for die-hard fight fans to stay connected to their favorite sport every day. As a full-fledged TV programming network, FITE televises live pay-per-views and TV tapings on a weekly schedule. Recently FITE announced the addition of exclusive interviews to its original programming, and started inviting fight celebrities to its close chat groups within the app. In December 2016 FITE CEO Kosta Jordanov announced new appointments to FITE executive team and the company is now spearheaded by a team of industry veterans from the Pro Wrestling (Michael Weber), MMA (Keith Evans) and Boxing (Roy Langbord) world. FITE is launched on February 9th, 2016 as a product of Flipps Media Inc, a company that brings digital entertainment content (movies, news and video) on television with its patented tap-to-stream functionality. Flipps Media Inc. is funded by EarlyBird Venture Capital, Tim Draper and LAUNCHub.